Add 100mL Wet Protect lubricant free of charge! 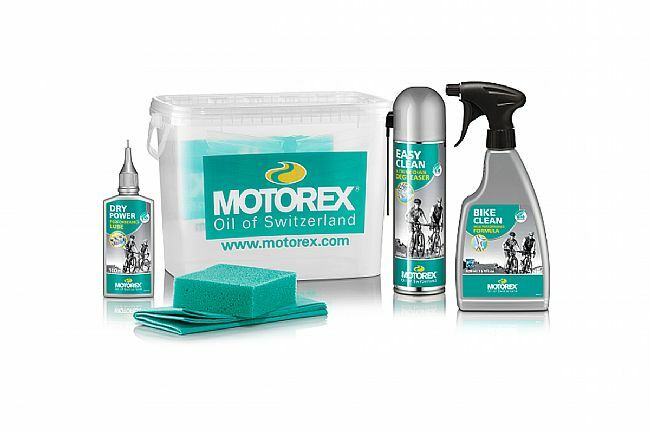 The Motorex Bike Clean Kit is an essential for anyone wanting to take care of their bike and prolong the life of their components! Kit containing 3 products in a practical bucket with sponge and cotton cloth, for easy and effective care. Essential cleaning kit for sport and leisure. EASY CLEAN 500 ml (degreasing agent for chains and derailleurs). BIKE CLEAN 500 ml (bicycle cleaner). DRY POWER 100 ml (chain lubricant). The plastic container for the cleaning products arrived cracked, a poor package for what is quality lubricants.